From left: Torrey Barnhouse, chair of the AHIMA Foundation; St. Scholastica alumni Jennifer Robertson, Theresa Wilkes and Ashley Lackner, and Bill Rudman, AHIMA's VP for Education and Executive Director of the AHIMA Foundation. Three Health Information Management program graduates received national recognition for their final research projects, further establishing the College's role as a leader in the field. There were only three students in the country recognized by the American Health Information Management Association's Research Poster Contest, and they all came from St. Scholastica. 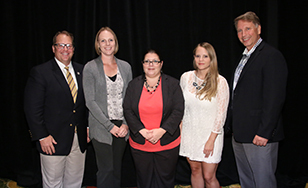 Ashley Lackner, Jennifer Robertson and Theresa Wilkes were recognized Sept. 28 at the 2015 AHIMA Convention and Exhibit in New Orleans, LA, and they also had a chance to share their research with industry peers at the event. Ryan Sandefer, chair and assistant professor of the Department of Health Informatics and Information Management, pointed out that a St. Scholastica HIM graduate student, John Mashikian, was honored last year as well. "This speaks volumes about the quality of our students' subject matter expertise, the high levels of faculty-student collaboration on projects, and the overall quality of student work," Sandefer said. "They are conducting research and developing projects that are making an impact nationally." "For me it's just validation of the great education I've received through St. Scholastica," said Robertson, who did her project about the application of health information privacy laws to student health services. The AHIMA honor "is the icing on the cake after more than a year's worth of research and writing," Lackner said. "It's great to see all of the hard work and effort put in not only by myself, but also by my final applied project advisor, recognized by a national organization." Lackner's project involved researching patient-generated health information technologies as well as the characteristics of rural communities. She created a comprehensive guidebook detailing how healthcare facilities can successfully implement PGHI technologies, with unique recommendations for those in rural areas. Wilkes said she was humbled by the award, and excited for the opportunity to share not only her research, but the core values of St. Scholastica on a national scale with AHIMA colleagues. "What an amazing honor to be selected to share our research findings and innovative projects with so many at the AHIMA national convention," Wilkes said. She conducted research aiming to create an e-tool to easily engage patients in their own medical records data quality, while also simplifying processes for privacy professionals and providers.